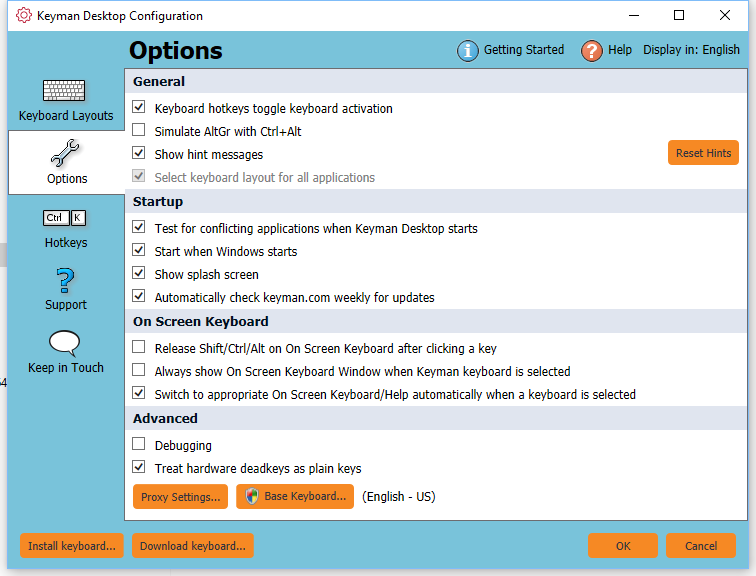 If you are having support issues with Keyman Desktop, you can create a debug log for Keyman Desktop. A debug log contains information to help Keyman support resolve support issues and improve Keyman Desktop. Tick this option to begin a debug log. The debug log automatically creates a folder called keymanlog on your Windows desktop. Untick this option to stop collecting a debug log. You should not need to use this option unless you are requested to do so by Keyman in relation to an issue you are experiencing. It is highly recommended that you switch off this option after obtaining the debug log. The keymanlog folder can grow very big very quickly! Privacy Warning - The debug log records anything you type while debugging is ticked. This would include logins and passwords! For this reason, Keyman only recommends switching the debug log on for short and isolated tests specifically requested by Keyman.